Ten day long Combined Annual training Camp ( CATC ) of NCC culminated with lots of programmes of literary, physical and mental exercise. 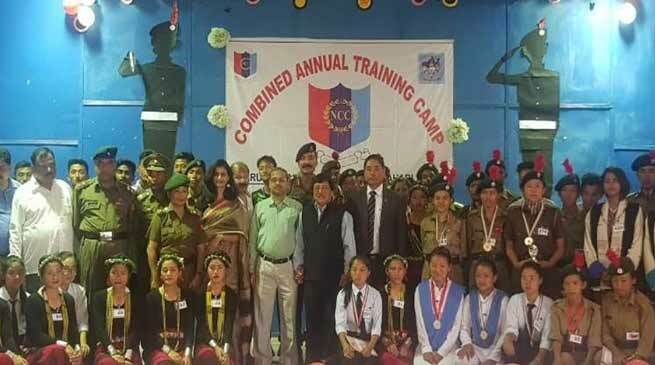 The ten day long Combined Annual training Camp ( CATC ) of NCC culminated with lots of programmes of literary, physical and mental exercise, training on weapon and cultural competition among the cadets of various schools and college of the Arunachal and Assam. Addressing the valedictory function School Education Director Gania Leij said that discipline and hard work yield result, if it is put up in right direction during the young age. While taking part in curricular activities in including games and sport NCC cadets should imbibe themselves to become a fine gentleman with patriotic in mind with a training for self defence. He was mesmerised by the cultural performances by the various team of the NCC and lauded their performance and said to become a good citizen one should be secular in thought and patriotic feeling. The multi talented cadets displayed various cultural programme of their respective states with a social ménage for all the cadets. Col R K Sharma 1 AP BN NCC appreciated the conduct and keenness of the cadets to learn during the Camp. The cadets underwent various training activities during the ten days training camp which included Firing, Drill, physical training and classrooms lectures. Disaster relief management demonstration and fire fighting demonstration were also organized by experts in the field. The cadets also expressed their satisfaction and appreciation for the training team who trained them for ten days. Few cadets while talking to this daily share their training at the camp and were seen happy with the quality food and accommodation and training they received with cultural diversity among the members concerned.